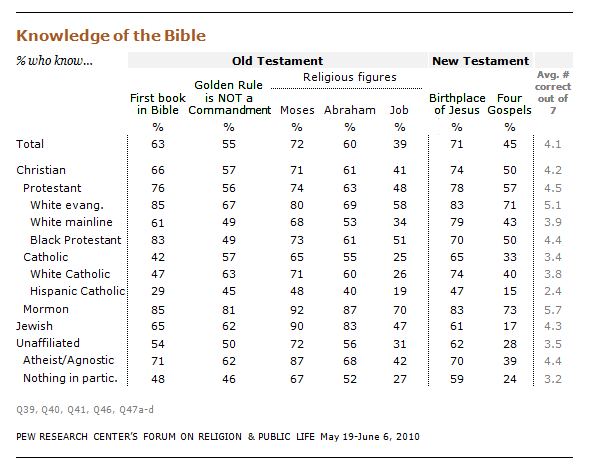 In 2010, the Pew Research Center Forum on Religion & Public Life conducted a survey asking 32 questions about various aspects of religion: the Bible, Christianity, Judaism, Mormonism, world religions, religion in public life, and atheism and agnosticism. The average respondent answered 16 of the 32 religious knowledge questions correctly. (Take a 15 question version of the Religious Knowledge quiz). The New Testament questions included the birthplace of Jesus. While Most Americans (71%) correctly said it was Bethlehem, 25% gave either Jerusalem or Nazareth as an answer. In addition to the Bible questions, the survey contained five items about elements of Christianity, including one question about the Catholic doctrine of transubstantiation (the belief that during Communion, the bread and wine become the body and blood of Jesus).